Darcy Barrett knows for a fact that there isn’t a man alive who can compare to her brother’s best friend, Tom Valeska. And she would know. She’s been gallivanting around the globe for years. But Tom belongs to Jamie, her twin. Or, 99 percent of him does anyway. So it doesn’t matter that Darcy’s loved Tom since she was eight years old. Because it’s never. gonna. happen. Hence the reason Darcy can’t stay in town longer than a night or two before she’s back on plane. His skin is hot satin. His pulse nudges me. Mine, mine, mine. One thousand percent mine until the end of time. He looks like he agrees. At last, AT LAST, 99 Percent Mine! Confession: I tried really hard to get my hands on an advanced copy of this book. But alas, to no avail. Tragic, right? I tracked the mail-lady alllll day waiting for this little gem to arrive at my doorstep and I wasn’t disappointed. Not one little bit. I’m not a huge fan of the first-person POV most of the time. But the way Sally does it…it’s perfect. 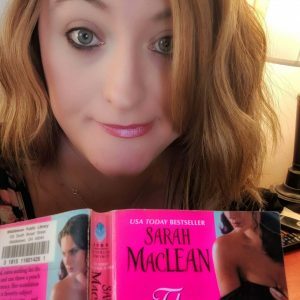 She has this unique, quirky, stream of consciousness thing that she does beautifully. It’s a bit scattered and nonlinear and that really works for me. The story feels like legitimate, natural thoughts. If you liked that about The Hating Game then you will find that here too. I’ve seen a lot of comparisons between 99 Percent Mine and The Hating Game and while that’s obviously going to happen I think it’s important to keep in mind that they are two completely different kinds of stories. Did I love 99 Percent Mine as much as The Hating Game? Well, no, but that’s because enemies to lovers is my freaking catnip and thus The Hating Game was my personal book dream come true. 99 Percent Mine might not be a sexually charged battle of wits but it is BLEEDING tortured angst and pulsing with unacknowledged feelings always on the brink of eruption. In a word, it’s yummy. I loved it. 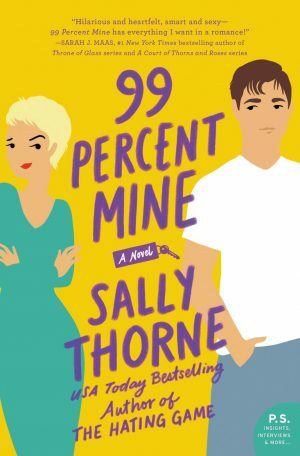 While I loved 99 Percent Mine, I can’t say that I always loved Darcy Barrett. Her penchant for self-destruction pissed me off a few times. I mean, I understood where she was coming from, I really did. But I still thought her default mode was selfish. But this is what makes a great character, right? Complexity and growth. Each character in this book is excellently executed. And I’m wondering…are we going to get Jamie’s story someday? He seems quite the arrogant douche in need of a attitude readjustment. I’d be very there for it. Sally Thorne. Sal. Ly Thorne. She’s so talented and I cannot wait to see more from her.